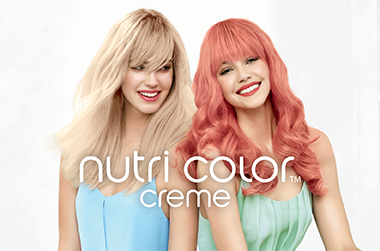 Introducing the cult favourite: Revlon Professional's Nutri Colour Creme range. The revolutionary take-home hair treatment not only creates luminous locks in a flash, but also repairs damaged hair to ensure an ultra-healthy look every day. My hair is quite curly and this treatment didn't sit that well in my hair. Once my hair dried it was left feeling a bit sticky. I think this might be better for those straight hair ladies out there looking for shine and a lovely fragrance. I have fine hair and this is great because it does not leave it limp, the only thing I would add is that I don't believe it adds volume, however, I would use this solely as a leave-in treatment/protection product and it definitely works for that! LOVE LOVE the smell not overly floral so doesn't overpower but does make your hair smell so fresh.